A short visitation with Heather and Keisha is next, then... moving on to some other stuff. Anyway. I hope things keep getting better. 🙂 It’d be lovely to see. I 100% understand with your point, but I think there’s some nuance here. They’re not ready to forgive Andi, completely. They only intended to find a way to cope and make peace with the situation, one day at a time. I doubt that they’re anywhere close to truly forgiving her, but I think Mari’s a little closer to understanding Andi’s situation. I read in a very good book called “Toxic Parents: Overcoming Their Hurtful Legacy and Reclaiming Your Life” that the problem with that line of thinking is essentially that forgiveness is treated as the beginning and end of the healing process, with the intention of benefiting the wrongdoer. Forgiveness is, if a step at all, a step that should come towards the end of the journey, for the benefit of the wronged. I think I have that book somewhere and have it on my ‘to read list’. But yeah, that more or less sums up the problems I had with the forgive and forget and what I’ve figured out that forgive and forget actually means. In my life and situation, forgive and forget has been used as a tool by the ones set out to hurt and control as a way of maintaining the status quo, keeping me with in arms reach to hurt all over again and to act like the issue has been resolved and never happened unless needed to bring it up again to bring me to heel/submission again. That is not what forgive and forget is, but it is almost always how it is presented. I know it’s supposed to be good for someone. And in this situation it definitely is. Still makes me slightly uncomfortable. DX Thanks lousy TV writers and my Mom’s nasty ex. Ya ruined something good. On one hand, you’re right, but on the other hand, your point isn’t catchy. ‘forgive and forget’ is, and in the end I think that’s going to win out. I think there’s sort of two definitions of “forgive.” There’s the conventional definition, but I feel like more and more, there’s an idea of choosing not to dwell on something that’s getting shoved into it, and the two are not the same. By choosing not to dwell on something, you’re refusing to let it control you. That’s why it’s one of the first steps to finding healing, because you have to be able to step back and look at things, or you’re never going to be able to get out. But true forgiveness rarely comes as a first step, as others above have said. It can’t happen until you’re really ready to move past what happened. As others have said, “forgive and forget” may be a decent last step, but it doesn’t really work as a first step. And I think the reason it’s being presented as a first step is because of this idea that choosing not to dwell on it is the same thing as forgiveness, and it’s really not. Well you need to fill that up right quick, Andi! I was hoping this alluded to a late Christmas present where she presents it to Todd or to Theo (who originally asked for it), but alas we have seen no such thing from her. Why in hells bells not is beyond me! Dang, woman, do they have to spell out their one xmas wish to you? I guess I just assumed that it was filled out off-screen already. But even then, when it’s 8 years later, how hard is it to have a birth certificate updated like that? I’m sure there’s at least a few legal hoops to jump through. Well, on the one hand, this could be leading up to a custody battle. But on the other hand, I don’t read Theo that way at all. So what this says to me is that he’s very much aware that if they put Andi off too strongly right now, they’re not going to get that paperwork signed. And since the paperwork is a vital part of their future as grandparents of Amanda, Theo has learned to choose his battles more wisely. Please try to keep your comments family friendly, Thank you. looks as if theo is channeling his inner slytherin – bide your time, play nice, until you get what you want, then….we´ll see. i mean, i´m NOT saying he´s outright planning to start a huge argument the moment tod is officially manda´s father, but this IS the kind of stuff that tends to get rehashed on family gatherings for *years* to come once everyone had a few drinks…..and then, theo won´t be forced to hold back saying what he wants to say. ‘i was drunk’ is always a nice excuse for saying hurtful things. This makes me fear a custody battle as soon as And Does put Todd’s name on that birth certificate. This is going to get ugly if that is where it’s going and Amanda will never forgive them. I would like to think that everyone involved is a better person than that and also smarter. Regardless of Andi’s lies and screw ups, Amanda has made noticeable improvements over all since Andi got her back. The priority of the Adoption place and the legal system should be the health and well being of the child over the needs/wants and pettiness of the parents. Andi has not made Amanda worse, in fact she’s providing Amada the resources and support to heal- which is what everyone wants. She’s the one that pointed out that it would be better for Amanda to have her first Christmas with her mom AND dad rather than separate and she was right. The family is right to be upset with Andi and Andi is still less than graceful and is still stumbling a bit but she has shown that she is not using Amanda to get back in good graces with them. She has shown that her priorities are Amanda and making amends for mistakes that honestly can’t be amended but she can at least own up to them and not repeat them or make them worse. Todd and his family are rightfully upset at Andi but they have no right to involve Amanda in their anger at Andi or do things that would disrupt Amanda’s stability and healing just to get back at Andi. The subject of custody will not be a easy one and it most likely won’t fit in a nice pre-made box like so many others but I do not think Todd or his family are so selfish or petty as to try to get even or one over on Andi for past wrongs through an ugly battle that would only screw over Amanda. Out of curiosity if Andi did put Todd’s name as the father on her birth certificate wouldn’t Theo have to convince Todd to fight for custody of her? He couldn’t legally start custody challenge without his approval could he? Why would he need to? Amanda is doing just fine with her mother and Andi isn’t using Amanda as a means to manipulate him. They’ve been fairly agreeable with each other despite Todd’s lingering anger. The only issue with custody is that it wouldn’t fit in a simple box because the daughter lives with her mom and the parents still get a long. The custody would protect Amanda from Andi’s mother or anyone else trying to mess with her in the event that Andi ends up in a situation and enable Todd and the Grandparents to have their say/be a part of the process should something happen to Amanda. That is why the custody is important. Not for challenge or revenge or such pettiness. Maybe I’m just late to the party, but I just noticed a theme of “Family comes first/is important”, redefined. 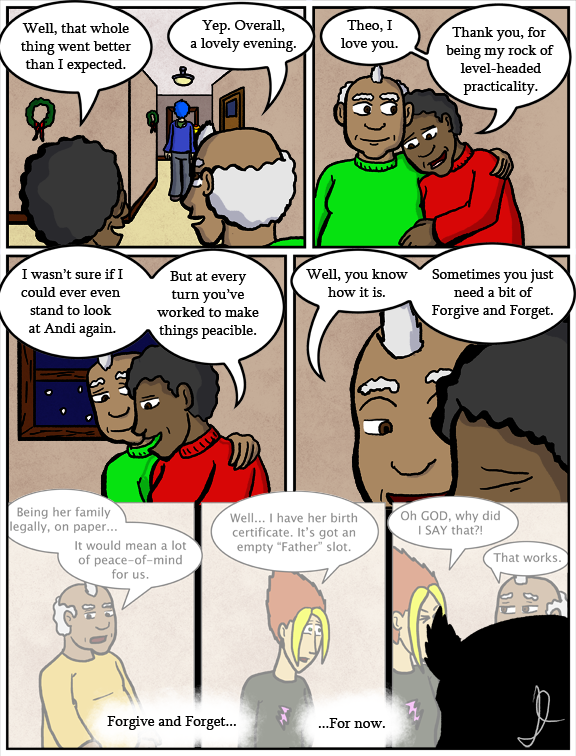 Amanda comes first for Mari and Theo, and that involves making some peace with Andi, but the narrative acknowledges that this all takes time and that forgiving Andi is not step 1 or even step 18. I think this is the most on-point analysis I’ve seen on these pages in a long time. As far as inner group relationship dynamics, yep. Spot-on. On the subject of forgiveness, sometimes you have to forgive the wrongdoer not for the benefit of the wrongdoer, but for your own peace of mind. Yeah, but I am of the view that forgiveness sometimes never has to be given. Though until we get elaboration, all we know is Theo is not 100% happy happy joy joy like he seems to push. He is up to something. Don’t do that. Amanda will never forgive you if you start a pointless custody battle for your own sake. Amanda will despise ALL of them forever. She’d bully more, probably run away and do much worse things. It’s not worth it just to spite And I for something she did as a scared teenager. It was a stupid thing for her to have done, but she’s clearly remorseful and regrets it. She’s sorry. Don’t take her daughter from her and make Amanda hate the little family she has. I think Theo is just making preparations in case a custody battle becomes decidedly LESS pointless. The “for now” suggests that he intends to let the current situation stand for the time being. Having a Plan B ready, does not mean you are already abandoning Plan A.
Let’s acknowledge facts: As quality mom decisions go, Andi has not started out doing very well by her Amanda (valid excuses like being very young and taking advice from her own mother are one thing, but the excuses don’t change the end result). She is doing her best to be a better mom now, but if it turns out she isn’t up to it, Theo has a backup plan in place that will bring Amanda into a household where she WILL be properly taken care of. Andi’s choice to give up her daughter wasn’t a poor choice, how she hid it from Todd was. That in no way impacts her current self’s ability to care for Amanda. She was 16/17 when she gave up Amanda. She’s, what, at least in his mid 20’s now. She has a job that is able to comfortably support herself. It’s slightly more difficult now that she has Amanda, but she’s able to provide for her as far as we’ve seen thus far. If you want to bring up her lack of outstanding as ables parent, bring up the aquarium when she freaked out and ran. She came back, certainly, but that’s a much better way to pass judgement on her parenting skills than when she gave up Amanda. That’s a way to pass judgement on her ability to be a good girlfriend. Todd’s lack of understanding towards his daughters (Amanda AND Selkie.) feelings due to his obliviousness is far more of a red flag to me. Not to mention his temper and kissing his daughter’s teacher with no regard to how that’d impact Selkie. All I’m saying is he isn’t winning any parent of the year awards either. I would still also add that she tried to come to Christmas dinner first, and only after was told no brought up it was for Amanda’s sake…Andi still has some growing to do, although she is getting to it in leaps and bounds. Yes… position the pieces and then when the time is right spring the trap. Amanda was given up for adoption and then subsequently adopted, legally would it even matter that Todd was her father? I would have thought that the whole adoption process made the biological parents irrelevant. If it doesn’t do that, then I guess Todd gets to start paying child support. I don’t see how the grandparents could win a custody battle to take Amanda away from her adoptive and also biological mother. Maybe they just want to be next of kin so if God forbid something happens to Andi Amanda can go to them or Todd instead of back to the orphanage (or theoretically Andis mother who wants nothing to do with Amanda). Along I’m including ‘taken away by CPS fo being an unfit mother’ as ‘something happens to Andi’ although that doesn’t seem likely. And sure Andi could designate them or Todd as the ones to care for Amanda in the event of death or other such event, but being officially related is probably simpler and harder to take away. I don’t think a custody battle is the primary reason Theo wants it. At the moment, Andi and her mother are Amandas only legal next-of-kin; in the eyes of the law, custody would to the grandmother if something were to happen to Andi. No one involed wants that to happen, so this is primarily a safety net in case something does happen. Anything beyond that would be secondary. And as far as Forgive and Forget goes, one should be ready yo forgive when the time is right, but one should never forget lest they want to run the risk of repeating the circumstances. I disagree with the last part: There is a point at which you might consider the problem so far behind you (and your relationship to the person who caused the problem) that forgetting is indeed the right thing to do, or at least one of several possible right things to do. Tangentially, one character in one of my stories still harbors intensely negative feelings toward someone who’s completely out of their life — someone they will most likely never encounter again. That anger and bitterness is not helping them or protecting them, just hurting them. I honestly think this is a just in case. Theo is probably preparing in case Andi tries to do something underhanded. He is a businessman, after all, owning a restaurant. I think he fears what I personally fear. Andi still hasn’t let Todd go, and I think Theo knows this. So if Andi tries to make Todd tied to her because of Amanda, trying to force Todd to take her back or take away visitation from Andi, they’ll have something to back up legally when they take Andi to court. I also, personally, don’t think this is something we’ll have to worry about. At least I really, really hope not. But I don’t know Andi’s thoughts enough to say for sure she wouldn’t pull this. I’m with the people who are saying this has nothing to do with a custody battle against Andi. It is about, what if something happens to Andi? Amanda’s next of kin in that case would need to be a warm loving family who cares about her, not that other grandmother. Interesting idea – now that Andi has a convienent “babysitter” for Christmas day – if she does go to her mother’s – what if Andi’s mother convinces Andi to just give custody to Todd since he wants her and the grandmother will presumably still say it’s a mistake for Andi to be a single mother on her own? I really hope Andi is strong-willed enough not to cave in to that pressure this time. Andi and her mother are people that Theo has no control over– and he will do whatever he has to do to protect Amanda. If that involves swallowing his feelings and making nice-nice with Andi until he gets what he wants– Todd’s legal right to Amanda– he’ll do it. He isn’t happy with the situation or with Andi but he has to do what a Dad does– put the kids FIRST. He may never strike out at Andi– but his attitude is gonna change towards Andi once Amanda has Todd’s protection. Andi’s mom was Todd’s prospective mother-in-law for some time– long enough for Theo to know EXACTLY what he is dealing with. He needs a way to keep Amanda away from that witch and Todd’s name on the birth certificate is how to do it.